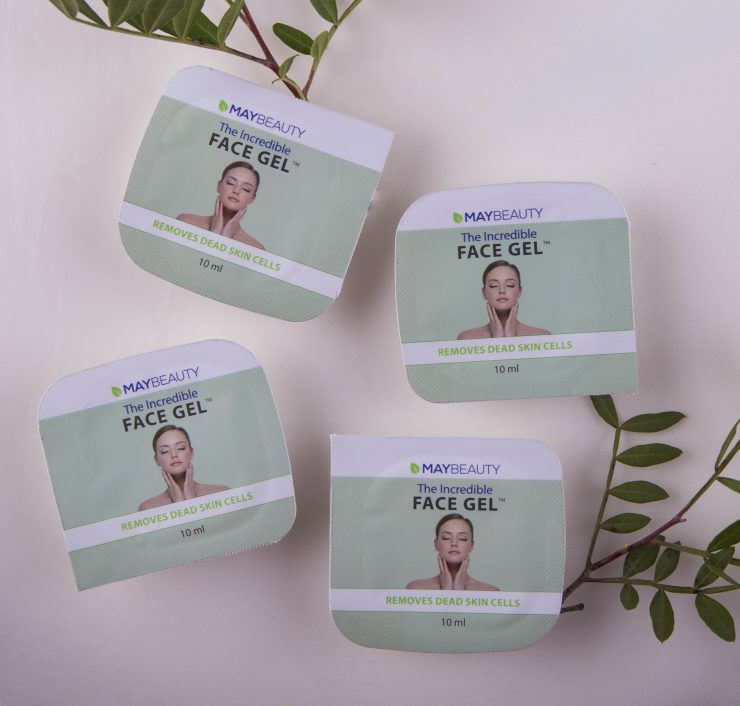 How incredible is the maybeauty incredible face gel? The incredible face gel was a product that I wanted to try out for a while now! And finally I had the chance to try it out! I’m testing it for more that a month now. So of course now I can tell you al lot more about this incredible product! Curious of it really works? What is the incredible face gel? This is a mild peeling or better a gommage. So when you bring it on you need to massage it into your skin, after a time a gritty texture will appear. And after a few minutes the texture will get a more gray color. So how longer you massage your skin how more death skin cells and oil will stay on the gritty texture. So the gommage is a mild but effective scrub. The face gel has a light pink color. It’s a very thin and watery gel. I can use one packing from 10ml twice. The gel itself smells a bit sweet but it’s especially a fresh smell! As you can see there is a lot of difference between the photos! The left on is before using the gel and the right one after! Waaoh, I was shocked after seeing the results! My skin looks so much better after using the gel! My redness and the impurities were less visible! My skin looked so much better after using it! It was much softer and brighter! So yes this gel is indeed incredible! And this result was only after one time using this! Yeeeeees! This face gel is just amazing! The product does what it promised and it’s even much better than that! The packing is so handy, it is a fantastic peeling for your skin without irritating it! The result are incredible! This is the best peeling I ever tried! And I really love the texture from this gel! It’s also so cool that you can see the color chance to gray from the gel. It’s so fascinating that the death skin cells just come off with this gommage. This product is just a must in your skin care routine! I’m using it now once a week! Because I love this product so much I have something special for you… Namely a discount code! With the code: elkeface30 you will get 30% off. So 8 cups are normally €26 but with the 30% off they are only €18.20! And that is for sure not much for such an incredible product! Jeetje, wat een goed spul is dit…Echt amazing, het verschil voor en na! Wat goed dat je huid er zo schoon van wordt en ideaal voor mensen die snel een geirriteerde huid hebben. Ik ben zeker onder de indruk! Ja het verschil voor en na is echt groot he! Wow dat klinkt veelbelovend! Het is wel duur, maar als het zo’n resultaat levert… Ik ga er eens over nadenken! :) Wat leuk dat je alles ook in het Engels schrijft trouwens! Ja,het is inderdaad vrij prijzig. Maar je komt er zeker lang mee toe en het product is echt de moeite! Ja, dit is direct anders zo’n gommage. Maar zelf vind ik het echt effectief en zeer fijn! Dit kende ik nog niet, ziet er goed uit!